Many developing nations do not only have serious population and pollution issues but also water-related problems. The regular outbreak of cholera, diarrhea, river-blindness, guinea-worm, typhoid fever, dysentery and other water-borne diseases in areas that lack access to clean, potable water remains a major contributing factor to high mortality rate, especially among children under five years. A United Nations Children’s Emergency Fund, (UNICEF) report estimated that over 57 million Nigerians lack access to clean water. According to the report, only about 26.5 percent of the population has access to improved drinking water sources and sanitation facilities. According to the report, Nigeria is among the five countries in the world contributing about one-third of the global under-five mortality rate traceable to the consumption of unsafe water. Instructively, provision of clean safe water would radically change this narrative. It was as a result of this that the sleepy town of Ilase-Ijesha, a community in Obokun local council of Osun State recently came to life as the inhabitants, led by the traditional ruler, came out in their numbers to witness the formal handover of a solar-powered borehole system donated by International Breweries Plc., ABInbev, through its CleanerWorld initiative. The relief is coming to the community after many years of neglect and coping with challenges of unavailability of potable water, especially water-related problems. In Logbara, a district of Orile-Imo community in Obafemi-Owode local council of Ogun State, access to safe water has been a major challenge to the residents, causing untold hardship, as the community resorted to drinking rainwater, which they harvest during the rainy season and during the dry season from other unreliable sources, which are miles away from the community. Worse hit by this predicament is the Primary Health Centre, located within the Owode area in Sagamu. Matron of the centre, Mrs. Funmilayo Sunmonu, recalled the nightmare patients and staffers hitherto go through to get water, particularly when a woman goes into labour. With the donation of a solar-powered borehole, she notes that the people in these communities can now heave a sigh of relief as the water nightmare is finally over. Speaking with excitement at the commissioning of the borehole, Akintoye Olufemi, a resident of Logbara, said the people are very excited and grateful for the facility, which has been servicing them even before International Breweries formally handed it over to them. 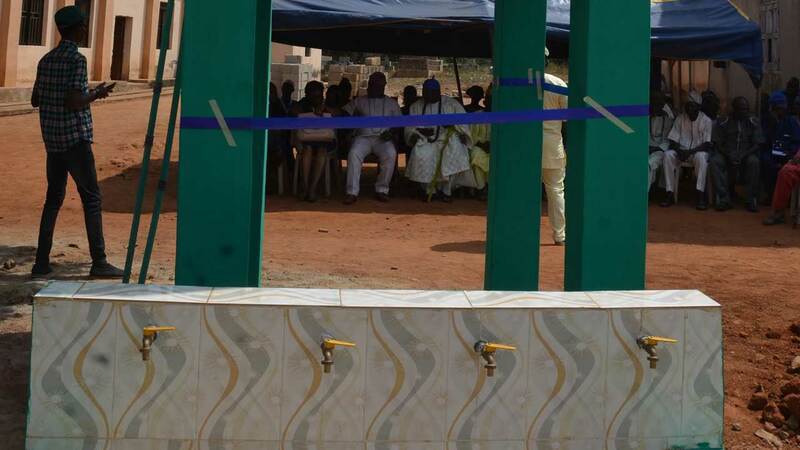 According to him, the community water challenge began after the Ogun State government resettled them from their original hometown where they were displaced due to the dualisation of the Abeokuta-Sagamu inter-change expressway. He noted that shortly after their resettlement, they discovered water was lacking in their new community, and this caused a lot of health challenges. “Being a peace-loving people, we continued to hope that one day the situation would change for the better, and that we have witnessed with International Breweries provision of solar-powered borehole in Logbara,” he said. Speaking on the initiative, spokesperson of International Breweries Plc, Otunba Michael Daramola, said that water is essential to every human being and also one of the core ingredients of brewing, and in line with the number sixth goal of the Sustainable Development Goals (SDG), which aims at ensuring a sustainable management of water and sanitation for all, the organisation deemed it fit to provide potable water for the communities where it operates. “As a socially responsible organisation, International Breweries Plc., had undertaken to help provide succour in the core area of water to these communities. The key focus of this initiative is in line with the Sustainable Development Goals of the United Nation, which emphasize on ensuring a sustainable management of water and sanitation for all,” he said. While inadequacy or unavailability of potable water is a problem in some communities, there are others for whom dysfunctional or unavailable healthcare facilities are a pressing problem. Investigations showed that functional primary healthcare centres are critical to the health and well-being of every community because of the important role they play in facilitating accessibility to affordable healthcare. Under its CleanerWorld initiatives, the company also renovated the Esa-Odo Primary Health Centre and donated hospital equipment to aid caregivers in providing better care for pregnant women. It also donated a generator to power the centre. “At International Breweries, we strive to impact every community where we operate and make it better than we met it. As a result, our projects are designed to be beneficial to the whole community and this is the essence of our give-back policy as encapsulated in our CleanerWorld and BetterWorld programmes, comprising water, health, culture and economic empowerment,” Daramola said during the handover ceremony. At the commemoration of the 2018 World Toilet Day, the federal government made a declaration and unveiled plans to stop open defecation, which has caused numerous health challenges due to water contamination. According to findings by the WHO/UNICEF Joint Monitoring Programme for Water Supply and Sanitation, statistics show that more than 120 million Nigerians do not have access to decent toilet facilities, while about 40 million others practice open defecation and this has contributed to the death of children under five years old, who have been infected by water-borne diseases. In support of the federal government’s declaration, the company adopted the Omi-Asoro Community Elementary School in Omi-Asoro, Osun State, which lacked decent toilet facilities and built a new toilet facility for the school, which was well appreciated by the staff and pupils of the school, led by the headmistress, Mrs. Abosede Asaolu, officers of the Community Based School Management Committee, SUBEB and the Parents Teachers Association, led by its chairman, Mr. Solomon Arowolo. Speaking at the handover ceremony, Arowolo, after giving a brief history of how the school was established, highlighted how open defecation has been one of its major concerns. “This new facility is, indeed, well appreciated and we are now happy that our children will no longer need to do their business in the open,” he said.